The conditions for today had several factors favoring severe storms. A deep semi stalled trough. Humid NE winds providing moisture. Lift index's of minus - 5 to -6. Quite high CAPE ( convective available potential energy ), and lastly a decent jet stream with exit region. The previous evening had seen a line of storms rapidly develop around 10.30pm. 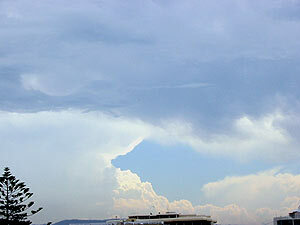 These storms had developed in a large cloud band aligned to a trough and cold front. They were not severe but gave some pre-bedtime amusement and something to watch out the window waiting for sleep. Storms embedded in cloud masses are not my cup of tea, so I was glad to see by morning that the cloud band had cleared eastwards, yet the wind was still humid from the N/NE and the trough had stalled. Instantly I reassessed upwards the Illawarra's chances. The night before I was convinced that the upper Hunter Valley 300kms north would be the best area. Being a work day I could not chase that far. The first storm of the day fired near Goulburn at 10.20am, very early. I hoped that things would not go off to early. Luck was on my side and it was not until 1.30pm that storms developed closer to the Illawarra. ( see first two pictures ). One of these storms ( picture 1 above ) became severe with 59mm ( over 2ins ) of rain falling in Bowral in less than 30 mins, small hail was also reported. A backshear was evident on the Bowral storm - with the jet being 70-80 knots this was a good measure of the storms strength. I was eager to chase, but first had to complete my shift at work. A closer storm around 3pm displayed some nice CG's for me to watch from my work window. I saw one CG hit the Port Kembla harbour breakwall, another only 1km went into the ocean. This storm was still growing and sucking in scud from the NE. 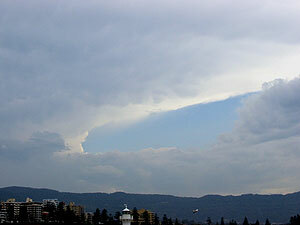 Around 4pm the scud went to total overcast and sealed in on the Illawarra escarpment. It was low enough to fog bound the top of the escarpment. To confound issues the Bureau radar went down. This was going to make a chase decision hard - which way do I head with no visual or electronic help. I choose to head west to Picton, rather then south into the storm line. I reasoned that this would take me into areas that had had the benefit of sunshine. The fog on top of the escapement lasted about 20 kms westwards, before suddenly lifting to reveal a massive anvil to my SW. There was also some development to the west. I headed for Mittagong to the SW. 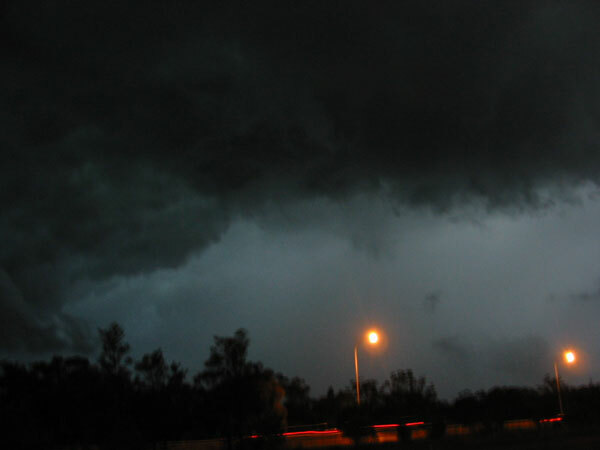 It started to grow quite dark and low scud again obscured my views. 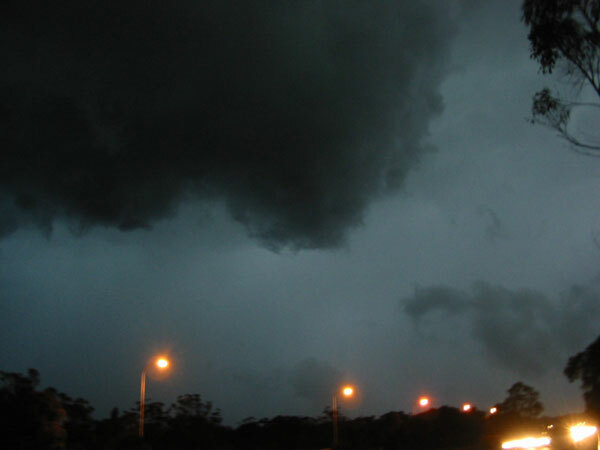 At Hill Top ( near Mittagong ) heavy rain began to fall. I tracked back NE up the freeway. Upon emerging the rain in a early twilight I saw that I was on the edge of the north flank of the storm which was convecting rapidly overhead, this was made more eerie by lightning up high in the cloud. There was quite a bit of turbulence in the flank cloud, but no rotation. I was able to leapfrog this storm for the next 30 mins in the dark. 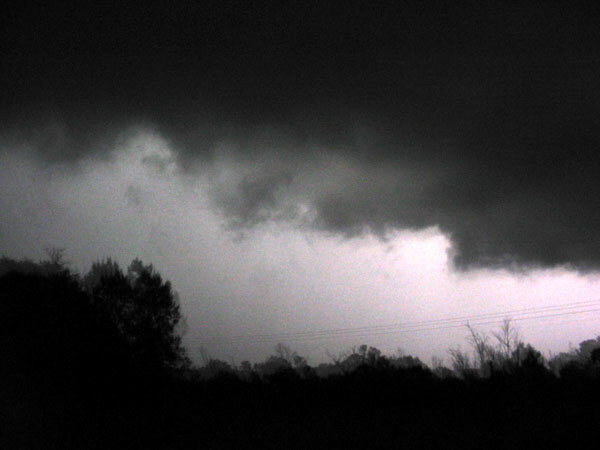 Lightning was very intense and I had several close strikes whilst taking pictures. Unfortunately I did not have my video camera, so I tried my best to capture a CG with the digital, but did not succeed. A great day. The first storm of the day near Bowral may have been a supercell. I am 90% certain that my storm was not, but rather a line of multicells. There was probably supercells in other areas today. Technical notes. The analysis chart for 4pm reveals a deep trough stretching from eastern Victoria, through New South Wales and into Queensland. Humid N/NE winds are feeding moisture into the trough. Lift Indexes are high and CAPE peaks just west of the Illawarra. The 1000 to 200mb maps show good directional shear with NE turning right around to almost west. The 200mb jet is around 80 knots and in the favoured right exit region.